Henry Rollins gets the perfect starring role. Since he started dabbling in acting in Adam Rifkin's 1994 action comedy The Chase, Black Flag/Rollins Band frontman Henry Rollins has become a dependable character performer, called upon whenever a role calls for someone shouty or intense or just wants to cash in on our goodwill for the singer/speaker/author. He's been well utilized here and there, most notably in Joe Lynch's Wrong Turn 2 and as a security guard laughably beat up by tiny Al Pacino in Heat. 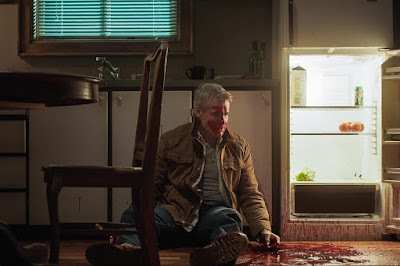 It hasn't been until the new horror comedy He Never Died, the latest feature from writer/director Jason Krawczyk, that a role has been so well suited to Rollins' strengths as an actor. I don't know for certain that the part was written specifically with Rollins in mind, but it might as well have been. He plays Jack, a mysterious loner who spends his days sleeping and playing Bingo, totally withdrawn from the rest of society. Into his life comes Andrea (Jordan Todosey), a daughter he never knew about from a woman he slept with once. She comes to live with him and gets a window into his life right around the same time that a few gangsters start showing up and causing trouble. Slowly, we start to learn more about Jack -- why he's so obsessed with Bingo, why he has such a deep knowledge of history...and why he buys bags of blood from a med student (Booboo Stewart) and keeps them stocked in his fridge. He Never Died isn't a great horror comedy, but it is a good one. It's shaggy and repetitive, never all that funny nor scary. The stakes are strangely low and difficult to invest in, probably because all the gangster stuff feels inserted just to provide some external conflict. The mystery of Jack's past and the gradual reveal of what's really going on with him is far more compelling, both because it's a new mythology in horror (or at least a twist on some that are familiar) and because of how it acts as a metatextual commentary on Rollins himself. As someone who has followed his career since the first time I heard "Low Self Opinion" in high school (I even went out and bought all of his spoken word CDs, practically memorizing certain passages), I know Rollins to be a very intense, very focused, seldom social man. He's a guy who works tirelessly, and I've always thought that he stays so busy because a) he doesn't know how to do anything else but work, work, work and b) he is holding a great deal of anger inside of himself and has to remain distracted so he doesn't explode. That's exactly what He Never Died is about. It shows Jack as a man determined to keep himself distracted. It answers the question of what happens when Rollins finally does explode, and the answer is pretty spectacular. The movie works best as a character piece -- both an examination of the character and the actor playing him -- and Rollins easily does his best work ever as an actor. His deadpan reactions, his total disinterest in human emotion, even his walk is funny. Krawczyk stages some good, gory black comedy, but it really is Rollins who's the whole show. He Never Died has a weird charm to it. It's messy but fun, and a rare horror comedy that's much more character driven than gag driven -- and that goes for both comedy gags and gore gags, both of which are in fairly short supply. It's got some interesting surprises in store (try to stay away from reviews and marketing if possible, including the trailer below) and a really great performance from Henry Rollins. His work alone makes the movie worth a watch, and I'm not just saying that because I'm afraid of him. 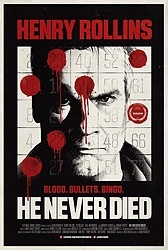 He Never Died will be in limited release and on VOD beginning December 18. Looking forward to this one. I read that the part was indeed written for Rollins. Just watched it. Really, really liked it! Rollins was great as a kind-of supernatural John Wick with Asperger's. A little more light-hearted at times than I expected which completely worked for me in this film. I definitely think this is one worth seeing. I'll never forget the first time I heard "Low Self Opinion" -- it chased me out of my bedroom and before I knew what was going on I was playing basketball. Hank is a powerful individual, is all I know. Can't wait to see the flick. Wooo clicked on the play button just i got to the end. Im gunna buy the hype and wait for the movie. Anybody else not rooting for daughter?